Martha's Favorites: LOVE IS IN THE AIR! Hello Ladies! Welcome to Tea Cup Tuesday! February is upon us, with Valentine's Day just around the corner! Next to Christmas and Easter, it is my favorite month. Love is in the air and we all act just a little foolish. I love it! I was with Noah at Target this week and he was willing to pass up a toy for himself to get a Princess wand for his mother and me (3 in a package, one for him too.) He told me his heart would be broken in half if he could not buy this with his own money. (He has no money, he's three!) When I finally said yes, he wiped his tears and said "Grandma, you are so useful." Isn't that what we all want to hear from a man? When we got home, he hide them so he can give them to us on Valentine's Day! It was his big secret. He told his Mom all about it, but she could not guess what the gift was until Valentine's Day! He is so cute! Right then and there, we all decided we had to take him on a date for Valentine's Day! While I am think about celebrating, we have a winner of the 4th Blog Birthday! Drum roll please . . .Brenda of http://downmemorylalalane.blogspot.com/ Down Memory La La Lane. 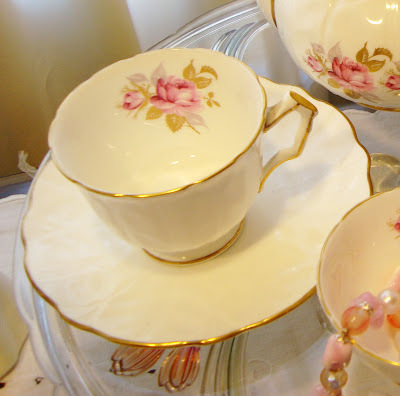 Brenda is new to blogging and has recently started joining us for Tea Cup Tuesday! Congratulations! Please email me with your information! I will be having another Giving Away next week. To celebrate 700 plus followers. This will be open to just followers, so if you are not a follower, this week is your chance. This is 98th Tea Cup Tuesday for Terri and I! Can you believe it? I thought I would show you this wonderful Tea Set by Aynsley. It reminds me of love. It was purchased for a Wedding Shower, I gave Vanessa and her husband, so many years ago. They were so in love. Her husband told me yesterday, that he loves Vanessa more today than he ever did when he first married her. A Mother cannot ask for more! What says "I love you" better than a rose? This next tea cup is a Taylor and Kent, Longton, England. 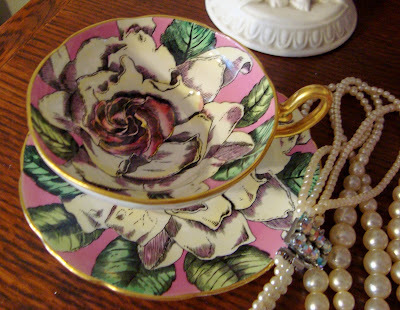 I love the single huge rose that covers this amazing cup. It is so very rich looking. Love the white with the pink center, almost like candy! This next cup also features a beautiful single rose. It is a common set you might have seen. 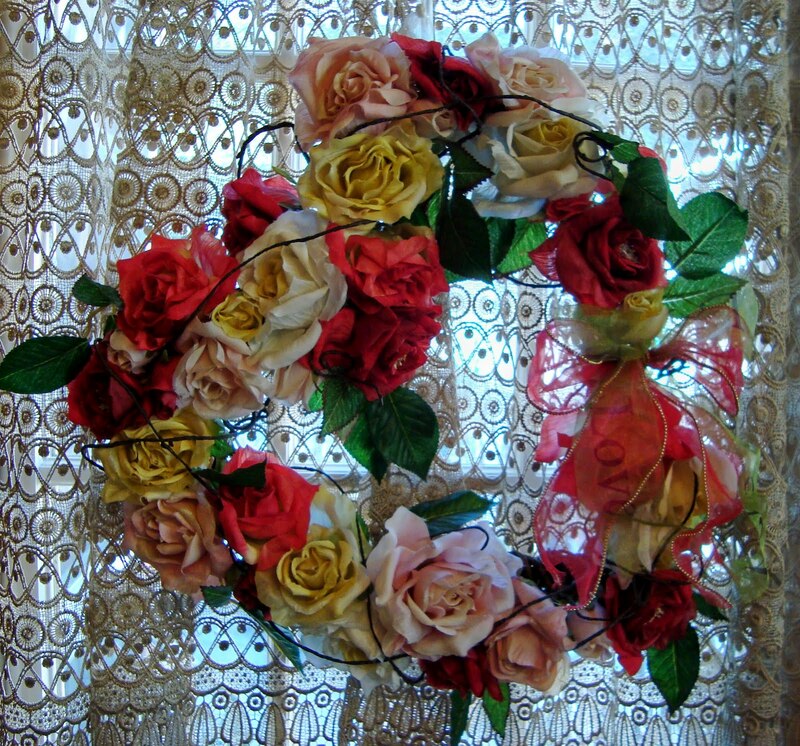 It is by Roy Kirkham, Redonte' Roses, Made in England. I am lucky enough to have the tea pot too. Since I usually only buy my cups at estate sales and thrift stores, I do consider myself lucky to have both. I purchased the tea cup first and a few years later, found the tea pot. Did I ever tell you I collect Vanity Boxes? You guessed it, I do! It is my fourth largest collection. I going to be sharing them with you this month. Here is Mr. Linky for this week. You know what to do. 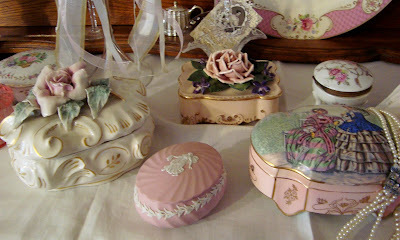 Please visit Terri, she just put a new face on her blog and it is beautiful. If you have not had a chance to purchase the new Shabby Lanes Magazine, take a peek. I have a two page feature it in I would love to have you read. 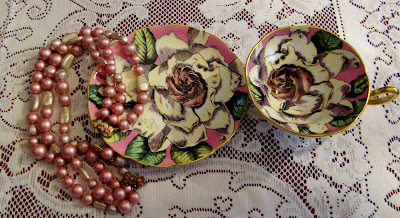 Here is my lastest listing, on Pretty Vintages Things! Great for Valentine's Day! Absolutely gorgeous, lovely and romantic! 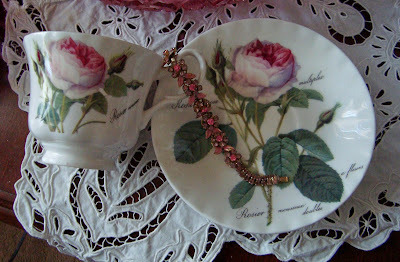 I am always charmed by your teacup collection - roses are the best way to say I love you! I am so pleased with my son-in-law - it does my heart good to know my daughter is so loved - so I understand completely - thank you for hosting - off to see Terri! Martha, you make me laugh when you say, "Did I every tell you I collect...." You have such lovely collections. I'm not surprised if you collect every beautiful thing that has ever been made:) Your rose teacups are gorgeous...every one of them! Roses are the most romantic flower I think. Perfect for Vatentine's Day. I just love the Taylor & Kent! Wonderful! 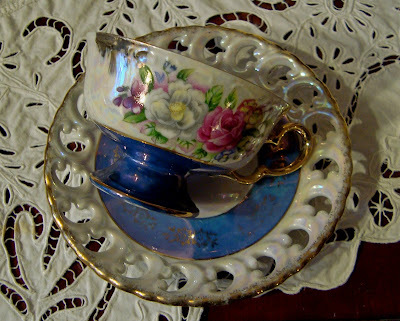 I have had portions of the Aynsley rose pattern, but with pale blue exteriors...think I have some around somewhere. I have always loved it! 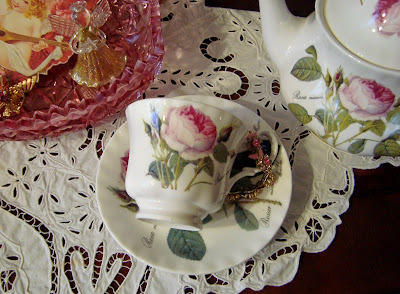 Thanks for linking with Tuesday Cuppa Tea! Love the Redonte Roses. I too buy my cups and pots at thrift stores and yardsales so I know what you mean about feeling lucky to have a match! Noah reminds me so much to my son. They are so cute in that age. Noah will become a lovlely boy and handsome man. And the love you give him today will always be with him. You have such a generous heart. The tea set is to die for. Nothing says more love than a rose. All your cups are personalities. And I am sure your vanit box collection is stunning, too. Congratulation to Brenda. She will have fun with that beautiful giveaway. Having someone who loves our children that much is one of the greatest dreams a mother has. How wonderful! What a sweet Aynesly set to remember the occasion by. That is one charming little grandson you have there! I have one who is three also but he lives on the other side of the country so we never have these cute conversations, unfortunately. Your china is lovely as always, Martha. Congratulations to your winner! Your blog today has sent me immediately to tears. First of all, your grandson is very adorable! His little heart is so pure, I know you must be beaming!! Just give him a great big hug!!! Second, I am so excited that I am the winner of your 4th Blog Birthday! Oh MY GOODNESS!! I will treasure it always! I think it's going to be a new start for me in collecting tea things. Your 98th Tea Cup Tuesday is so awesome. You have so many beautiful things to share that it just makes me feel happy to be a woman. Many, MANY thanks to you, Martha. You are AWESOME! So many beautiful looking tea sets I can't choose a favorite. I love any with a rose. Have a good day. Big congrats to you Martha, I'm going to find the Shabby Lanes magazine so I can see your two page feature! 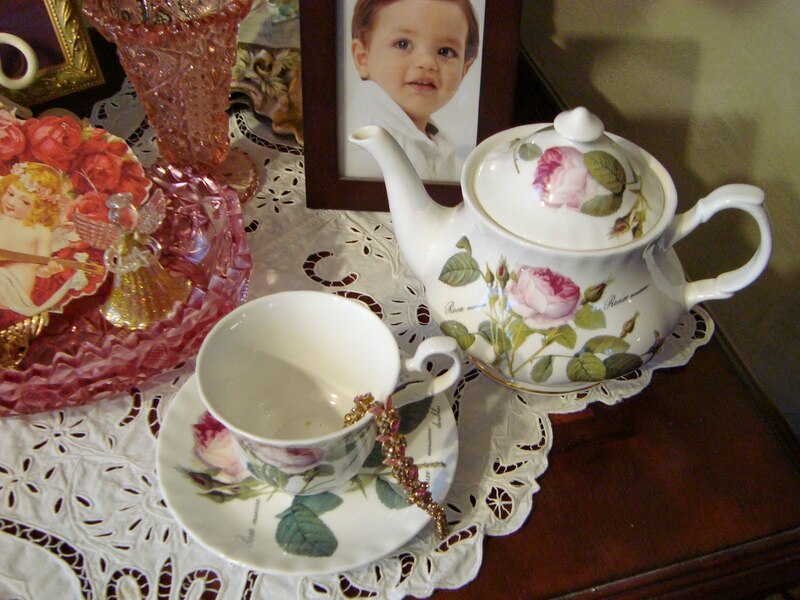 I just adore the story about the tea set you gave to your daughter and son-in-law. That's really sweet! As always, Martha your teacups are beautiful. I love the story about your sweet grandson wanting to buy the wands with his own money. What a sweet little fellow. You are obviously a great influence on this young gentleman, and I'm sure you have a special bond with each other. God Bless Grandmothers and Grandsons! Martha, Noah is such a sweet boy! Isn't three a wonderful age? Well, any age really! Your cups today are beautiful. 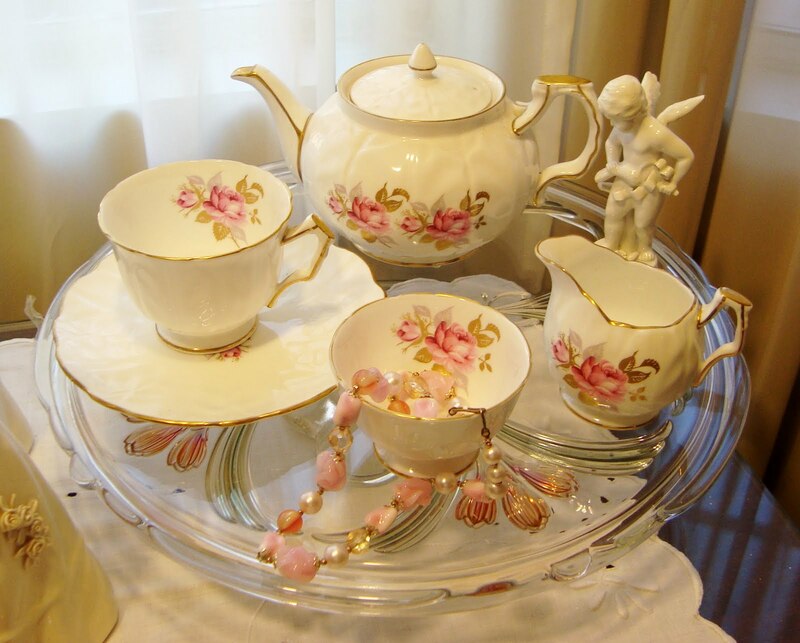 I am loving the Aynsley tea set! Wow, that is a very pretty set. I have the roses set too! The star midfielder faces his former club Western Bulldogs, who have replaced Roarke Smith with Billy Gowers. There also good news for Sydney with Dan Hannebery making his long awaited return from injury, at Dan Robinson expense. Melbourne has made two changes with Cam Pedersen and Jayden Hunt coming in for Joel Smith (shoulder) and Bernie Vince. Savannah Dietrich was 16 when she was sexually assaulted by two teenage boys as she lay unconscious on the kitchen floor in a Louisville, Kentucky home. They had been drinking with other friends before the incident. When bear t shirt she woke up, she knew something had happened, boyfriend and girlfriend shirts but it would be months before she knew how they had taken advantage of her, that they had photographed the funny running shirts assault on their cell phones.